Fransiska’s business, a local bookstore in Indonesia’s capital Jakarta, is frequently impacted by unpredictable electricity. Although her business is in a commercial area, the power often goes out during peak business hours. These interruptions affect her ability to run her business effectively: lights are often dim, her store gets hot because she is unable to run fans, and she must revert to slower methods of manually recording sales and receipts. Unfortunately, this situation isn’t uncommon. The country’s unique geography, an archipelago of more than 17,000 islands, poses enormous infrastructure challenges to achieving nationwide electrification, and rapid urbanization has increasingly overwhelmed the grid. More than 30 million Indonesians lack electricity, while millions more experience frequent blackouts, unpredictable power outages and unstable connections. President Joko Widodo‘s ambitious 2015 electricity investment program calls for 35,000 megawatts (MW) of power by 2020, involving the construction of 291 power plants, 1,375 substations and 732 new distribution and transmission lines as an effort to achieve nationwide electrification and improve Indonesia’s energy quality. Indonesia will need about $43.7 billion worth of investments to expand its transmission and distribution network to achieve Widodo’s electrification goals. But first, electricity planners need good information about the current state of electricity quality and access to ensure these massive investments pay off. While this will be a big task, a new program is taking an innovative approach—getting power to those who need it most by crowdsourcing data. The Electricity Supply Monitoring Initiative (ESMI) is an initiative conceptualized, developed and implemented in India by Prayas (Energy Group), Pune, India. It was publicly launched in March 2015 in India and currently covers several hundred locations across India. Visit www.watchyourpower.org or www.prayaspune.org/peg for more information. WRI is collaborating with Prayas, Energy Group and partnering with the Institute on Essential Services Reform (IESR), Consumers Union of Tajikistan, and the Energy Change Lab to pilot ESMI in new geographies such as Indonesia, Tajikistan and Tanzania, respectively. The Institute on Essential Services Reform (IESR) in Indonesia, in partnership with Prayas Energy Group (PEG) and WRI are piloting the Electricity Supply Monitoring Initiative (ESMI) in Indonesia to gather this data. 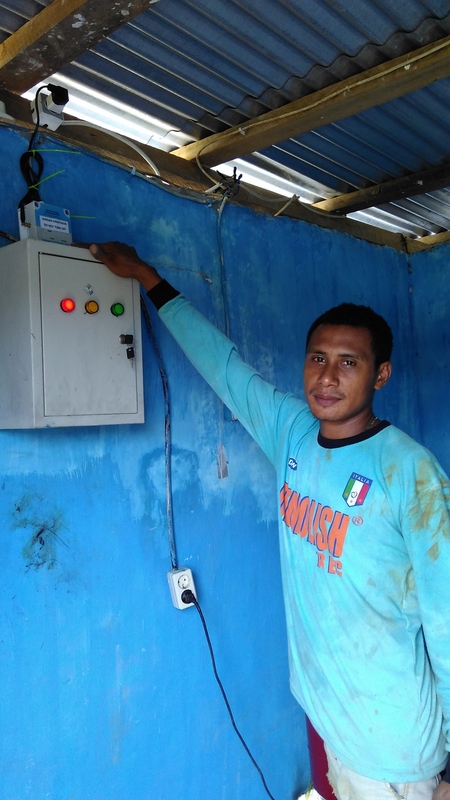 Organizers worked with individuals to plug in easily-installable electricity supply monitors (ESMs) across 25 locations in the Jakarta area, such as households, small businesses, farms and public buildings. These devices record and log data on electricity supply, including information on outages. Voltage supply is recorded by the minute, and data is sent to a central server using mobile networks and made available online. Connection isn’t everything. Despite being connected to the grid, power voltage levels were fairly low throughout the area (210 volts being low, 220 volts being normal and 250 volts being high). Low power voltage levels affect appliance performance or the ability to charge electronics such as mobile phones. Capacity isn’t everything. In most locations, installed electricity capacity exceeded consumption, meaning that buildings are not consuming more electricity than they have access to, and therefore should not be experiencing problems with their quality of supply. Yet many buildings continue to experience problems with supply and quality, in the form of power trips. Interruptions are common. All ESMI-monitored locations experienced some degree of electricity interruptions, lasting from less than 15 minutes to several hours, pointing to the fact that being connected does not mean having a continuous supply of electricity. This limits the ability of people to carry out simple tasks. Ideally continuous supply would be common practice in Indonesia, and ESMI data can help inform decision makers on how to make that happen. This data provides stakeholders with a picture of electricity quality patterns across a given region, enabling them to make more accurate geographical comparisons and make strategic decisions on how to improve power access. Already, IESR has found that frequent electricity interruptions in the form of electrical trips stem from a combination of low power voltage and appliance use. IESR will use this information to work with Perusahaan Listrik Negara (PLN), the state-owned electricity company, on improving supply through grid maintenance or installing clean energy options such as rooftop solar PV. This data also provides citizens with the evidence they need to approach PLN about improving service quality and holding the utility accountable for inferior services. Where previously they might have no proof of substandard power quality beyond flickering lights, malfunctioning appliances or daily outages, citizens can now point to hard data. PLN is required to publish data on electricity quality performance every three months; if actual service deviates at least 20 percent from the published information, customers are entitled to compensation. ESMI in Indonesia is still in a pilot phase and data is limited by sample size and coverage. Moving forward, IESR plans to disseminate this data to policy makers, other civil society organizations, and consumer group, to raise awareness of electricity quality issues in the country. Furthermore, IESR, PEG and WRI plan to scale ESMI across Indonesia. Nationwide ESMI data can help inform policy and investment decisions as the president continues to roll out his ambitious electrification plan. Unreliable energy limits economic growth, undermines poverty reduction efforts and constrain people’s lives. Power outages make it difficult, if not impossible, for families and businesses to perform even the simplest tasks like cooking, washing their clothes and lighting their homes and shops. With the right data, electricity planners and others can pursue solutions that can bring power to those who need it most.